This powerhouse Latin Jazz orchestra delivers a performance as diverse as the cultural and musical backgrounds of each of its members. Interwoven with Afro-Cuban, Jazz, Caribbean, and South American traditions, their original Latin fusion music is fierce and beautiful. Releasing their debut album, Quiero, May 2015, the Latin Jazz Network hails the album "richly atmospheric, acoustically brilliant, and the vocalists and instrumentalists have been captured in a recording that hardly lacks in authenticity...[creating] music that is uninterruptedly arresting as well as music that is profoundly moving." Begin with "richly atmospheric, acoustically brilliant,” Cocomama and end with the upbeat, soul-shaking, afro-funk, latin jams of Underground Horns- an evening of music unlike anything you have ever experienced. “Music for the people! 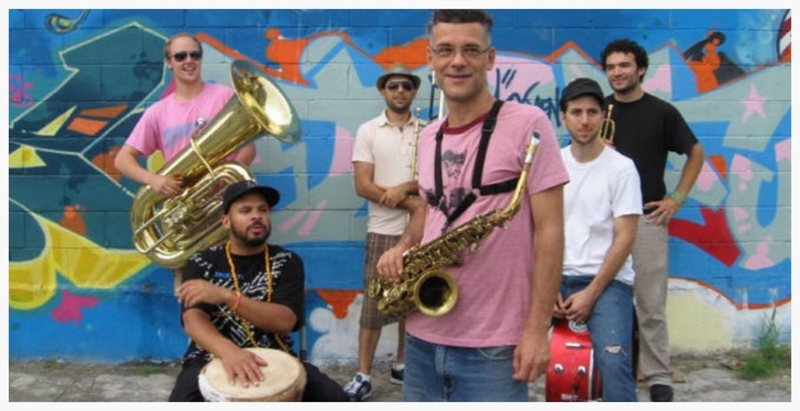 !” is what the Brooklyn-based brass band, Underground Horns, is passionate about creating. As subway performers, they mastered adding a little pep to your step and perfected their multi-ethnic, culturally diffuse sound that can be characterized as “Afro Funk Bhangra New Orleans grooves and beyond.” In their own words, “we are cooking audio gumbo…our special recipe includes some funk, jazz, hip hop mixed with brass band traditions spiced up with African and other world rhythms." According to the New York City Jazz Record, Underground Horns has a plethora of different noises that are all unified by the, “crisscross rhythmic sound, which interacts with the frontline, providing all the broad organic support that the horns need.” Audiences are guaranteed to be enthralled by the complex rhythms, layered melodies, and precision required to successfully blend each distinct sound as they can’t help but move their hips and tap their feet to the unforgettable beat that will stay with them long after the show is over.